I've been trying out a few hot chocolates from high street coffee shops and thought I'd have a go at making one at home. This uses a combination of items including my Tassimo hot chocolate, some squirty cream, mini marshmallows and chocolate curls. Obviously the key ingredient here is going to be a syrup, Monin is my brand of choice so I had a search online to see what they make, and pretty much everything was the answer. High street brand Costa have used Monin Blackcurrant and Cherry syrups in the past, but I've not seen them use Black Forest syrup despite the fact Monin make the stuff, I ordered a bottle to give it a try. I decided on adding three teaspoons of the syrup to my mug before setting off the Tassimo. High street coffee shops can be quite hit and miss on the amount of syrup you get, but here I could do a careful measure, adjust if needed and replicate it if its spot on. Th syrup is a deep reddish brown and smelt sweet like chocolate and cherries. I gave the drink a sip and knew immediately that bottle of syrup was a brilliant purchase. Monin are always really good at recreating the exact flavour they promise to in their syrups and this was no exception. The drink was an absolute perfect Black Forest gateau flavour, their was a lovely sweet fruity dark cherry taste, and this went well with rich tones of chocolate and a creamy aftertaste. Every sip was an absolute pleasure, sweet soothing heaven. I suppose I need a disclaimer about Black Forest gateau being my favourite cake, so this is perfect for me. I think I’m going to explore the other syrups available so that I can make some more home made creations. The only thought that struck me was that I have no idea why Costa don't use this specific syrup in their Black Forest hot chocolate instead of trying to recreate it using other Monin fruity syrups. I've not actually had a Costa Black Forest Gateau hot chocolate yet this year, so I'm going to have to order one and compare it to this. It's going to be hard to beat the home version though; it tasted fab, was easy to make and comes in at a fraction of the price. 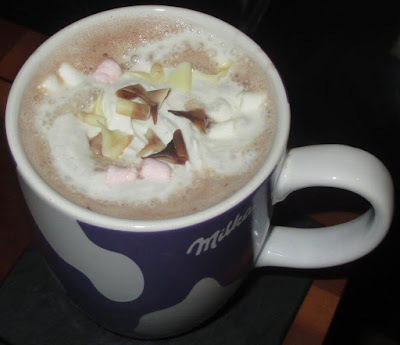 Which hot chocolate do you use in your tassimo? Milka - ordered from the website as it isnt in supermarkets here sadly.